Unfolded size: 2.1m * 1.5m (6.9ft * 5ft). 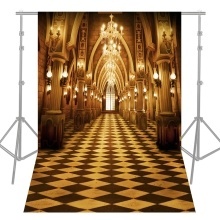 Portable and foldable photography backdrop can be hung easily. Made of high quality polyester fiber, durable and dirt-proof. Do not wash the backdrop with water. Type: Varied non-holiday style backdrops for your option. Using a series of high-tech digital production equipment carefully printed backdrop digital pictures. The picture is realistic and fade-resistant with good color fidelity and artistic effect. Ideal for adult & children portrait, holiday and party photography. Also can be used as decorative backdrops.